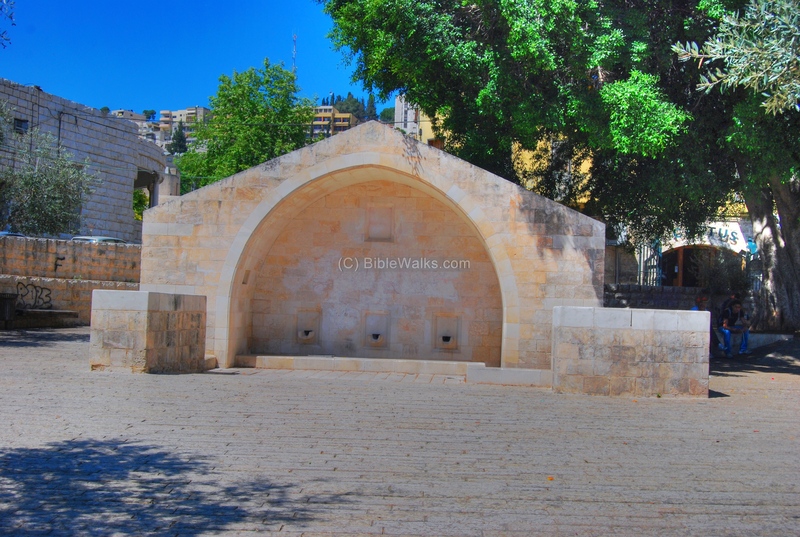 The spring is located in the center of downtown Nazareth. According to a tradition, this was the place where angel Gabriel announced to Virgin Mary that she will give birth to the son of God. "And she took the pitcher, and went out to fill it with water...". Mary's Well is located in the center of the downtown Nazareth, on the main road. The site is actually a modern water trough, which was built over the ancient trough, which was used by the women and animals as drinking water. The well gets its water by pipes from a natural spring about 200M north of the well, and was used throughout the ages. According to the tradition, this was the place where Virgin Mary, Mother of Jesus, was announced by the angel Gabriel that she will have a son of God. The well and the nearby natural spring was an important source of running water in the ancient times. 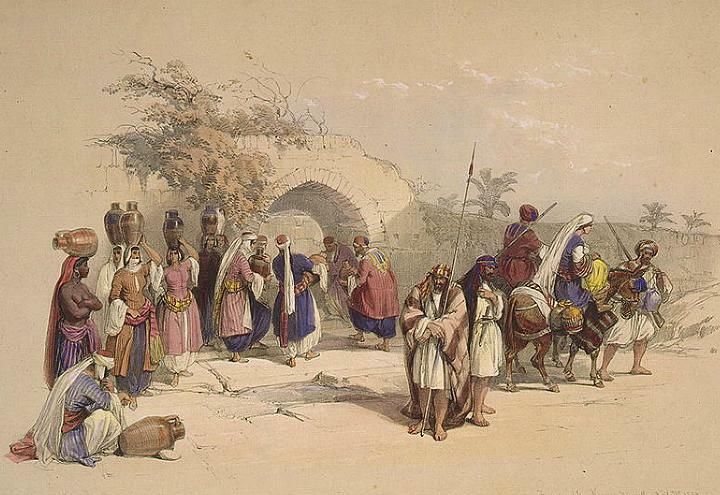 The importance of the running water in ancient times was one of the most critical elements for the location of the villages. 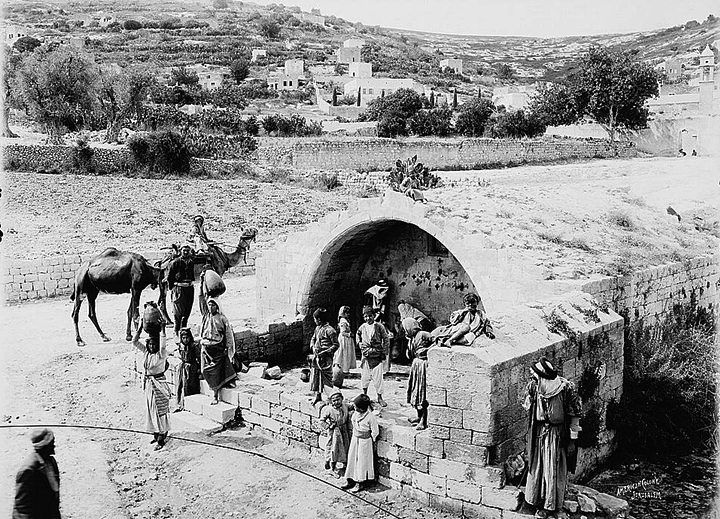 The location of ancient Nazareth was governed by 3 basic elements: the location of the springs, the topography, and the location of the road that passed through the village. 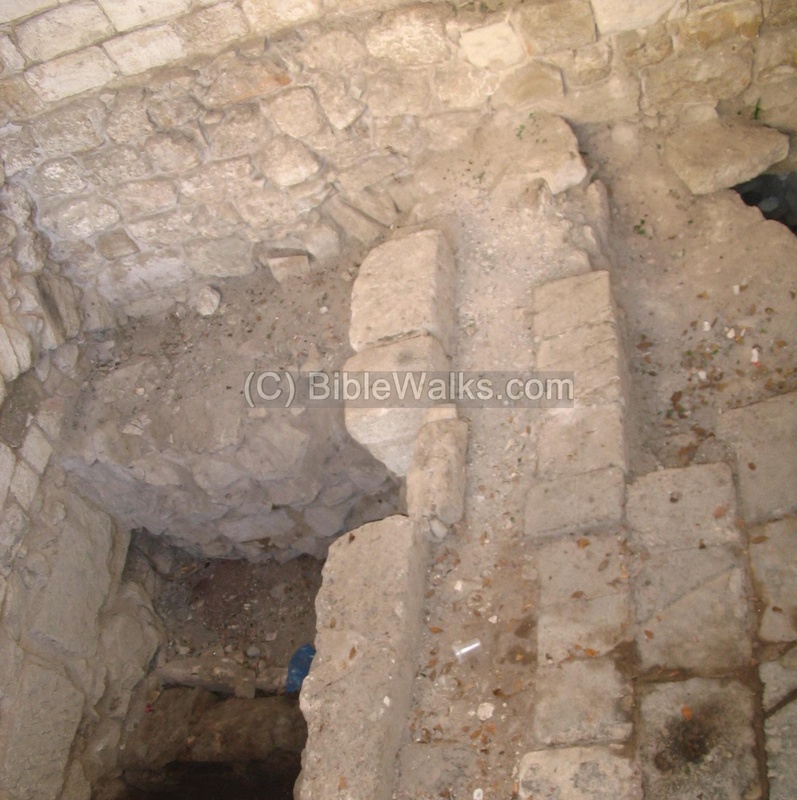 In late Roman times, and especially in the Crusader period, a series of tunnels were cut into the rock, and the water was distributed to the houses in the vicinity. This water system was in use throughout the ages. In the 19th C the well-house was rebuilt. 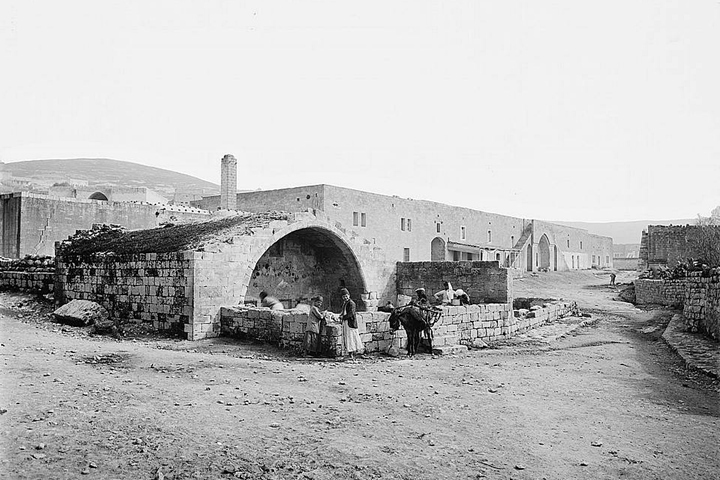 The photos below show the site at the end of the 19th Century. In 1767 St Gabriel Church was built nearby (150M up the hill) on top of a Crusader Church. In the ground level there is a flow of water that is connect to the well by pipes. The Greek Orthodox believe this is the site of the Annunciation, basing it on earlier texts. Another site, according to Catholic church, is the Basilica of Annunciation, located at the house of Mary. The structure was demolished and rebuilt in the 1960s. 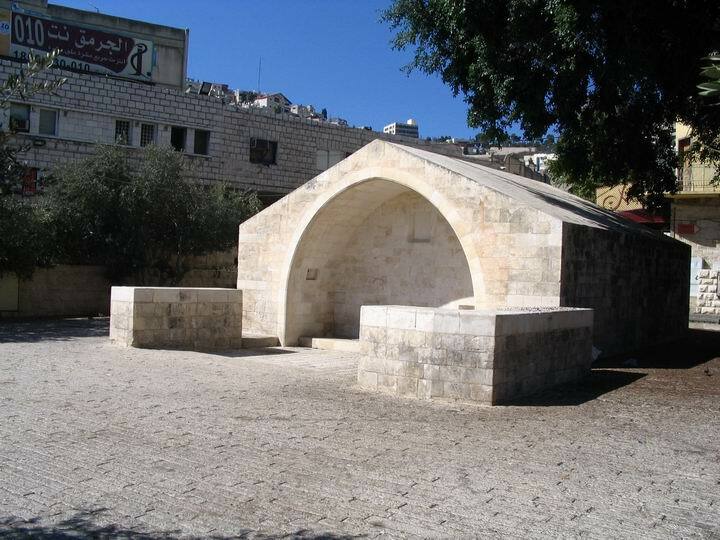 You can drive on the main road of downtown Nazareth and stop at the site, which is located at the side of the road. Mary's Well structure, seen in the photo below, is a modern water trough. Another view of the well is seen below. In the rear of the structure, you can see the original old stone canals laid out beneath the structure. This canal brought the water from upstream - St Gabriel's Church, about 100M away. From this place, walk behind the structure and visit St. Gabriel Church. "And in the sixth month the angel Gabriel was sent from God unto a city of Galilee, named Nazareth, To a virgin espoused to a man whose name was Joseph, of the house of David; and the virgin's name was Mary. And the angel came in unto her, and said, Hail, thou that art highly favoured, the Lord is with thee: blessed art thou among women. And when she saw him, she was troubled at his saying, and cast in her mind what manner of salutation this should be. And the angel said unto her, Fear not, Mary: for thou hast found favour with God. And, behold, thou shalt conceive in thy womb, and bring forth a son, and shalt call his name JESUS. He shall be great, and shall be called the Son of the Highest: and the Lord God shall give unto him the throne of his father David: And he shall reign over the house of Jacob for ever; and of his kingdom there shall be no end. Then said Mary unto the angel, How shall this be, seeing I know not a man? And the angel answered and said unto her, The Holy Ghost shall come upon thee, and the power of the Highest shall overshadow thee: therefore also that holy thing which shall be born of thee shall be called the Son of God. And, behold, thy cousin Elisabeth, she hath also conceived a son in her old age: and this is the sixth month with her, who was called barren. For with God nothing shall be impossible. And Mary said, Behold the handmaid of the Lord; be it unto me according to thy word. And the angel departed from her". Note that the well or spring is not mentioned in this text. "And she took the pitcher, and went out to fill it with water. And, behold, a voice saying: Hail, thou who hast received grace; the Lord is with thee; blessed art thou among women! And she looked round, on the right hand and on the left, to see whence this voice came. And she went away, trembling, to her house, and put down the pitcher; and taking the purple, she sat down on her seat, and drew it out. And, behold, an angel of the Lord stood before her, saying: Fear not, Mary; for thou hast found grace before the Lord of all, and thou shalt conceive, according to His word." 1997-8 Excavations by Yardenna Alexandre and Butrus Hana - revealed 2nd C AD Roman pottery, Crusader water complex, and later periods.